After more than two years of execution, this core project was completed within quality, safety and schedule targets. Last month, Alpha ECC successfully installed for hand-over of 140 MT capacity Pull-in Winch system and other auxiliauries of an offshore FSO. Last month marked an outstanding event of Alpha-ECC, the successful delivery of Mid Water Arch structure of an offshore project in Vietnam. After successfully finishing a trial sample of transportation module for a reputable international client, Alpha-ECC was honored with an award of its serial production. 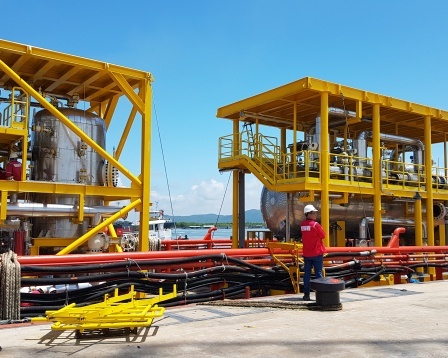 In August, our offshore team completed the repair modification of old process piping support and replacement of support structure on DGCP offshore platform. Alpha ECC successfully manufactured and delivered a set of three phase separator skid & degassing vessel skid to its client last month.